Taylor hauled in two of his six targets for eight yards in Sunday's 33-17 loss to the Colts. Taylor converted all three of his targets for 64 yards in Saturday's 25-16 win over Washington. Analysis: Taylor didn't command a notable share of targets, but had a 35-yard reception that helped the Titans drive down the field for the game-winning score. He has now quietly led the team in receiving yards for three of the past four weeks, highlighted by a 104-yard performance in Week 13 against the Jets. Though the second-year pro has delivered only sporadic production, he appears poised to end the season strong and will likely earn some offseason hype heading into the 2019 season. Taylor caught two his five targets for 17 yards in Sunday's 17-0 win over the Giants. Analysis: Taylor finished second on the team with five targets but failed to continue his two-game run of solid performances. The Titans' passing attack was dampened by rain, though his poor output is reminiscent of letdowns earlier in the season. Due to his inconsistency -- he has five games with two or fewer catches -- Taylor is a deep-league option only. Taylor brought in six of seven targets for 59 yards in the Titans' 30-9 win over the Jaguars on Thursday. 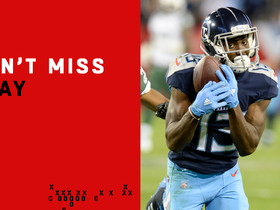 Analysis: Taylor paced the Titans in receptions, receiving yards and targets on the night, although it was the running game and Derrick Henry that took center stage on Thursday. Taylor has provided reason for optimism with his play in his two games since returning from a foot injury, bringing in nine of 12 targets for 163 yards over that span. The speedy second-year wideout will look to maintain his momentum against the Giants in a Week 15 interconference showdown. Taylor hauled in three of his five targets for 104 yards in Sunday's 26-22 win over the Jets. Analysis: Taylor participated in game action for the first time since Week 9 and displayed plenty of big-play ability. He was quiet for much of the game but came up with a 44-yard reception on the Titans' first drive of the fourth quarter and followed that up with a 55-yard reception before being hauled down 10 yards shy of the end zone. However, Taylor isn't likely to see a high number of targets for the remainder of the season and entered Week 13 averaging only 10.2 yards per catch. Taylor (foot) practiced fully Wednesday, Turron Davenport of ESPN.com reports. Analysis: Taylor, who last saw action Nov. 5, is thus poised to play Sunday against the Jets. His production to date has been modest aside from a seven-catch, 77-yard effort in Week 4, so until he starts seeing consistent volume in the Tennessee offense, he's only a fantasy lineup option in the deepest of formats. Coach Mike Vrabel hopes to have Taylor (foot) back in Week 13 against the Jets, Erik Bacharach of The Tennessean reports. Analysis: After missing the last three games because of a foot issue, Taylor stands a good chance of returning to the fold in Week 13. The second-year wideout hasn't posted particularly big numbers during the 2018 campaign, though he does have a seven-catch, 77-yard effort under his belt from Week 4 versus the Eagles. Cameron Batson saw a corresponding increase in offensive snap count in Taylor's absence, but Batson's playing time should fade once Taylor is officially cleared to return. Taylor (foot) has been downgraded to out for Monday's game against the Texans, Jim Wyatt of the Titans' official site reports. Analysis: With Taylor still out, Tajae Sharpe and Cameron Batson are once again in line to work as the Titans' top secondary targets at receiver behind Corey Davis. Taylor (foot) is listed as questionable for Monday's game against the Texans, Jim Wyatt of the Titans' official site reports. Analysis: Taylor was a limited practice participant this week and his status for Monday is truly up in the air after he missed the last two games. 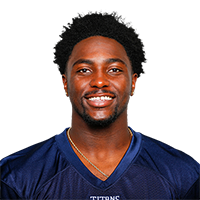 The 23-year-old has modest numbers with 21 receptions for 214 yards and one touchdown in eight games, but would nonetheless provide a boost to the Titans' depth at wide receiver if able to suit up at Houston. 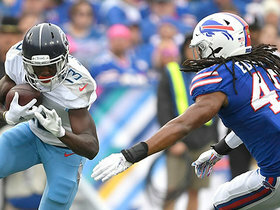 Taylor (foot) was listed as limited during Thursday's walk-through practice session, Jim Wyatt of the Titans' official site reports. Analysis: Taylor has missed the team's past two games, but his return to practice Thursday has him trending in the right direction as Monday night's game against the Texans approaches. 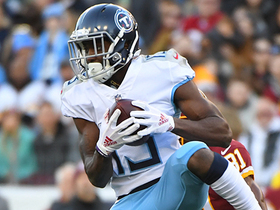 Once healthy, Taylor will bolster the Titans wideout depth behind top receiver Corey Davis, but the 2017 third-rounder's fantasy value remains modest, given his lack of target volume of late. Taylor (foot) took part in Wednesday's practice, John Glennon of The Athletic reports. Taylor (foot) was downgraded from questionable to out for Sunday's game against the Colts, John Glennon of The Athletic reports. 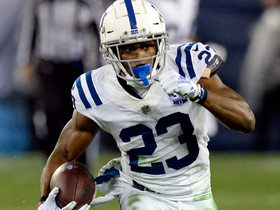 Taylor (foot/questionable) didn't participate in Friday's practice while receiving treatment and labeled himself a game-time decision for Sunday's matchup with the Colts, Terry McCormick of TitanInsider.com reports. Taylor (foot) wasn't spotted on the field at Thursday's practice, Turron Davenport of ESPN.com reports. Analysis: Taylor has now sat out each of the Titans' five official practices since he exited the team's Nov. 5 win over the Cowboys with the foot injury. 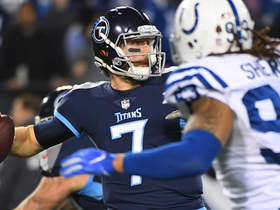 Unless he's able to return to the field Friday in some fashion for the Titans' final practice of the week, Taylor looks on track to miss a second straight contest Sunday in Indianapolis. Taylor (foot) didn't practice Wednesday. Analysis: Per Jim Wyatt of the Titans' official site, coach Mike Vrabel relayed that Taylor could return to practice later in the week. However, if Taylor is unable to rally in time for Sunday's game against the Colts, added opportunities behind top wideout Corey Davis would be available for Tajae Sharpe and Cameron Batson. Coach Mike Vrabel said Taylor (foot) has a shot to return to practice this week, Jim Wyatt of the Titans' official site reports. Analysis: Unable to practice in any capacity last week, Taylor never seemed to have much shot of suiting up Sunday against the Patriots despite being listed as questionable on the final injury report. He did ditch his protective boot Thursday and was then spotted walking around the team facility without a noticeable limp. The Titans are hopeful to get Taylor back for a crucial Week 11 game against the Colts. The first practice report will be released Wednesday afternoon. Taylor (foot) is inactive for Sunday's game against the Patriots, John Glennon of The Athletic reports. Taylor (foot) is listed as questionable for Sunday's game against the Patriots, Turron Davenport of ESPN.com reports. Analysis: Since he was knocked from the Titans' recent victory in Dallas due to a foot injury, Taylor was unable to log any practice reps during Week 10 prep. However, he ditched his walking boot Thursday and didn't walk with an evident limp, per Davenport. With a "questionable" tag in tow, Taylor's availability may come down to a game-time decision for Sunday's 1:00 PM ET kickoff. Taylor (foot) wasn't spotted on the field for the open portion of Thursday's practice, Turron Davenport of ESPN.com reports. Taylor (foot) was held out of Wednesday's practice, Turron Davenport of ESPN.com reports. Analysis: Per the report, Taylor wore a protective boot at the team facility Wednesday after injuring his foot during Monday's 28-14 win over the Cowboys. Tajae Sharpe (ankle) also dealt with an injury during the contest, but he was able to stay in the game and practiced in a limited fashion Wednesday. The Titans may need Cameron Batson to fill in for Taylor as the No. 3 wide receiver Sunday against New England. The role doesn't have much fantasy appeal in an inconsistent Tennessee offense. Taylor is questionable to return to Monday's game against the Cowboys with a foot injury, John Glennon of The Athletic reports. Analysis: Taylor came down awkwardly in the third quarter and appeared to be in pain. The young receiver currently has two catches (on two targets) for 24 yards in Monday's game and will cede work to Cameron Batson and Darius Jennings if he remains out. Taylor caught one of two targets for eight yards in Sunday's 20-19 loss to the Chargers. Analysis: Taylor recorded only one catch for the second consecutive week and now appears planted behind Tajae Sharpe on the depth chart. While Taylor has shown glimpses of big-play potential in preseason performances, that has rarely translated to regular-season production. 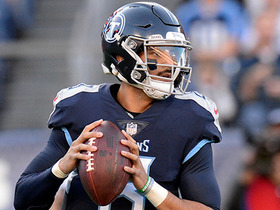 Given the current state of the Titans' offense, there is little reason for optimism surrounding Taylor's performance for the remainder of the season. Taylor caught one of two targets for 13 yards during Sunday's 21-0 loss to the Ravens. Taylor caught three of five targets for 30 yards and lost a fumble during Sunday's 13-12 loss to the Bills. Taylor caught seven of nine targets for 77 yards during Sunday's 26-23 win over the Eagles. Analysis: Facing fourth and 15 and trailing in overtime, Marcus Mariota uncorked a rope to Taylor on the left sideline, a gain of 19 yards on the way to the Titans' comeback win. His seven catches matched his previous season total and his 77 yards passed his previous season total. Was it Mariota's improved health or a thinned out depth chart that did the trick? It's tough to say at this point. Sunday's game against a middle-of-the-road Bills pass defense should help shed some light. With Rishard Matthews set to be released by the Titans, Taylor has one less competitor for targets in the team's offense. Taylor hauled in four of his five targets for 30 yards Week 3 against Jacksonville. Analysis: Taylor continues to build up his role among the crowded receiver corps in Tennessee, though that hasn't led to great results. While he led the team in targets Week 3, his longest catch went for only nine yards. He was matched up against a tough Jacksonville secondary, but Marcus Mariota and Blaine Gabbert combined for just 108 passing yards. Until that quarterback play improves, it will be difficult to trust Taylor as a starting option, regardless of how many targets he receives. Taylor hauled in three of his four targets for 32 yards and a touchdown Week 2 against Houston. Coach Mike Vrabel said that he wants to get Taywan Taylor more snaps going forward, John Glennon of The Athletic and Jim Wyatt of the Titans' official site report. Analysis: Vrabel specifically mentioned Taylor's speed as a threat to opposing defenses and the need to get him more involved in the offense as a result. Taylor played just nine snaps Week 1 against Miami and failed to connect with Marcus Mariota on an end-zone target. However, with Delanie Walker (ankle) likely out for the season, another pass catcher will need to step up in the Titans offense, and Taylor could emerge with a larger role. Taylor saw only one target but wasn't able to haul it in during Week 1 against Miami. Analysis: Taylor was limited to only nine snaps, playing behind Tajae Sharpe in the opening game of the season. His minimal role was surprising given the cautious approach the team took with Rishard Matthews, holding him well below his usual snap count. Taylor had shown flashes of brilliance in game action in both his rookie campaign and preseason action, though it appears he'll need either injury or time to gain more trust with the coaching staff to gain an increased role. Taylor secured all four of his targets for 95 yards and two touchdowns in the Titans' 30-14 preseason loss to the Buccaneers on Saturday. Taylor had a quiet preseason opener Thursday in Green Bay, catching one of two targets for nine yards in a 31-17 loss. Analysis: Taylor's lone catch came courtesy of backup Blaine Gabbert on the team's third drive. The second-year wide receiver has been working on the outside in camp with Rishard Matthews (undisclosed) sidelined, but this poor performance suggests he still needs to develop in that role. Don't be surprised to see Taylor back in the slot when the games start to count. Taylor said he's exclusively been playing at outside receiver through the first few days of training camp, PaulKuharsky.com reports. Titans general manager Jon Robinson said Wednesday that he doesn't anticipate adding any marquee wide receivers, as he's happy with the current group consisting of Taylor, Rishard Matthews, Corey Davis and Tajae Sharpe, Jim Wyatt of the Titans' official site reports. Taylor caught one of three targets for five yards in Saturday's 35-14, divisional round loss to the Patriots. Analysis: Taylor's unremarkable performance in his final appearance of the season was par for the course in an underwhelming rookie campaign. He lost a battle for the slot receiver job to pending free agent Eric Decker this past offseason but shouldn't have much competition for that role next year with Tennessee unlikely to invest more draft capital into the wide receiver position after selecting Corey Davis and Taylor in the first and third rounds, respectively, of the 2017 NFL Draft. Taylor caught his only target for four yards in Saturday's 22-21, wild-card round win over the Chiefs. Analysis: Taylor continues to see minimal usage with all three of the wide receivers ahead of him on the depth chart healthy. Don't expect that to change this postseason. Taylor finished without a catch but contributed a five-yard run in Sunday's 15-10 win over the Jaguars. Analysis: The win secured a playoff spot for Tennessee, but the rookie wideout didn't have much of a hand in that accomplishment. While Taylor has big-play potential thanks to his speed and ability to make defenders miss in the open field, he didn't get to showcase those skills much in a rookie season that finishes with 16 catches for 231 yards and a touchdown in addition to 43 yards on eight rushing attempts. Taylor wasn't targeted in the passing game, but he did produce an eight-yard rush in Sunday's 25-23 loss to the 49ers. Analysis: Taylor's redraft value is shot with all three wide receivers ahead of him on the depth chart healthy. The rookie third-rounder hasn't caught a ball in two weeks. Taylor failed to catch his lone target in Sunday's 12-7 loss to the Cardinals. 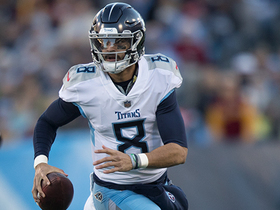 Analysis: Quarterback Marcus Mariota (knee) threw for 159 yards without a touchdown, so none of the Titans' pass catchers had a particularly successful outing. With fellow wideout Rishard Matthews (hamstring) back in the lineup for this one, Taylor was relegated to the No.4 wide receiver role behind Matthews, Corey Davis and Eric Decker. Taylor's value would remain minimal even if he leapfrogged one of the guys above him, as evidenced by his quiet outings during Matthews' absence. Taylor caught both of his targets for 15 yards in Sunday's 24-13 win over Houston. Analysis: Tennessee drafted Corey Davis in the first round and Taylor in the third while also adding free agent Eric Decker to bolster the wide receiver position this past offseason, but the trio has flopped with a combined 811 receiving yards and two touchdowns. Taylor's lone trip to the end zone came back in Week 6, and his minimal involvement despite Rishard Matthews' (hamstring) absence suggests the Western Kentucky product is unlikely to be a major contributor for the rest of his rookie season. Taylor caught one of two targets for eight yards in Sunday's 20-16 win at Indianapolis. Analysis: Taylor didn't see any increase in role with fellow wide receiver Rishard Matthews (hamstring) sitting this one out, as six other teammates finished with more targets or yards. The rookie has big-play ability, but he isn't getting many opportunities to showcase those skills. Taylor turned three targets into two catches for 24 yards and added a four-yard rush in Sunday's 24-20 win over the Bengals. Analysis: Coach Mike Mularkey did a good job of keeping all his weapons involved, as 11 different players registered either a carry or a reception. Outside of a 61-yard effort with a touchdown in Week 6 against the Colts, Taylor is yet to top 50 receiving yards or get into the end zone. Taylor lost four yards on his lone catch while getting targeted twice in Sunday's 23-20 win over Baltimore. Analysis: Taylor's role shrank with fellow rookie Corey Davis (hamstring) suiting up for the first time since Week 2. While Taylor's an explosive talent, he won't get many opportunities to showcase his skills as the team's No. 4 wide receiver when everyone's healthy. The Indianapolis Colts break up Tennessee Titans quarterback Blaine Gabbert's pass on fourth-and-14 in waning moments. Tennessee Titans quarterback Blaine Gabbert passes directly to Indianapolis Colts cornerback Kenny Moore for interception. Tennessee Titans quarterback Blaine Gabbert launches a pass deep to wide receiver Taywan Taylor for 35 yards. Tennessee Titans quarterback Marcus Mariota throws a dart across the middle to wide receiver Taywan Taylor. Tennessee Titans wide receiver Taywan Taylor lays out for a 44-yard catch on a pass from his quarterback Marcus Mariota. Tennessee Titans quarterback Marcus Mariota launches a deep pass to his wide receiver Taywan Taylor for 55 yards. Tennessee Titans wide receiver Taywan Taylor jukes out multiple Buffalo Bills defenders after snagging catch for 19-yard gain. 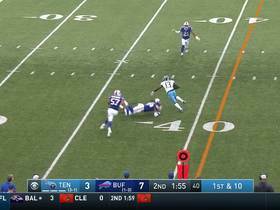 Buffalo Bills Tremaine Edmunds causes Tennessee Titans wide receiver Taywan Taylor to fumble. The ball is recovered by Bills linebacker Matt Milano. 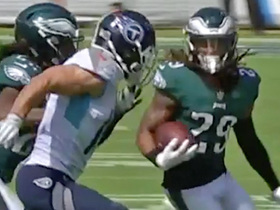 Philadelphia Eagles rookie cornerback Avonte Maddox intercepts Tennessee Titans quarterback Marcus Mariota and returns it for 23 yards. 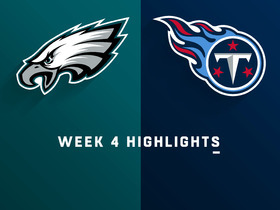 Watch highlights of the Tennessee Titans defeating the Philadelphia Eagles 26-23 with seconds left in overtime for Week 4 of the 2018 season.